Discussion in 'All non-AMD/Intel CPUs' started by KD5ZXG, Feb 13, 2018.
overdriven inductors. He named this logic device "Parametron". have provided the same pump waveforms for all that mattered. reversing the pair of output wires, giving us Minority Logic. 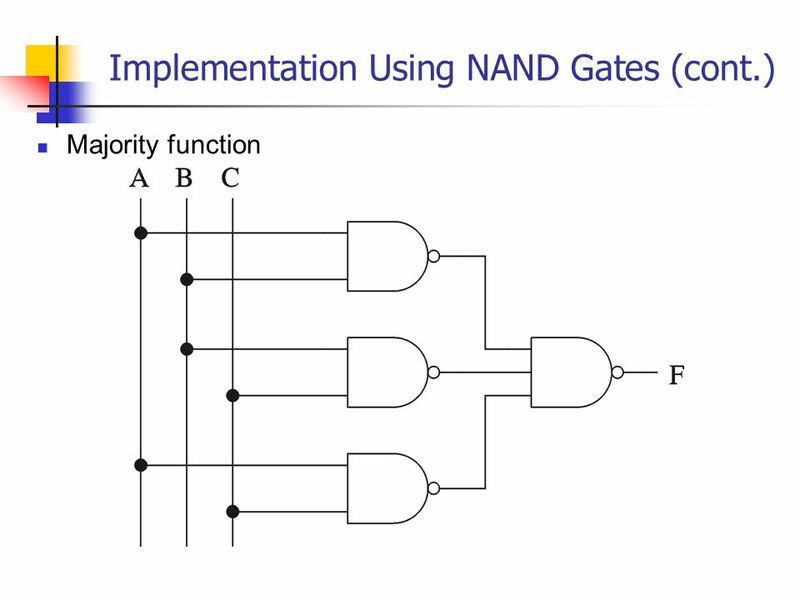 NAND and NOR are universal gates that can build anything. A minority of three gate replaces both. 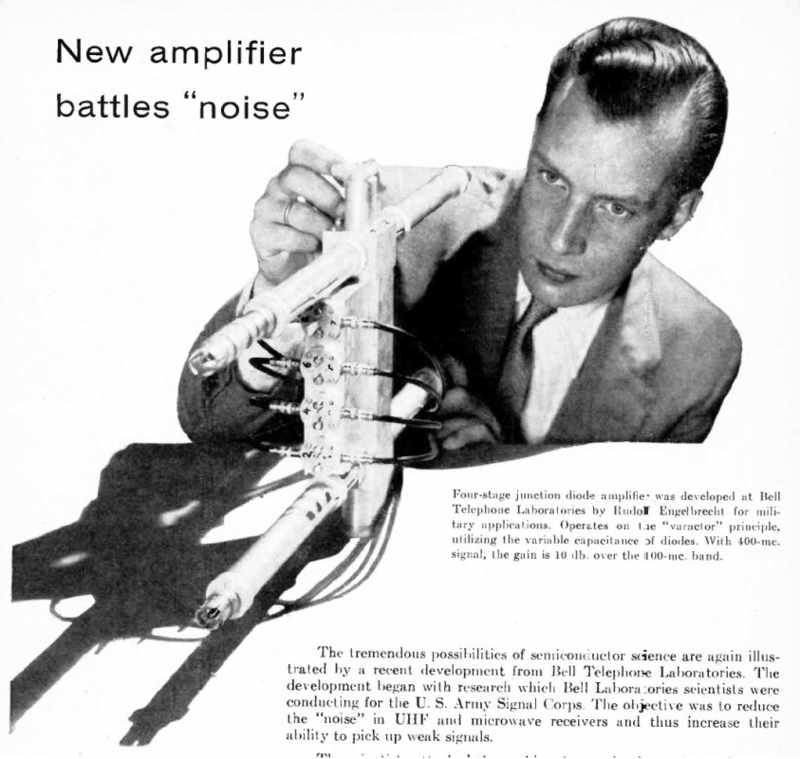 as transistors become impossibly small. Directionless logic may become the easier trick to pull off. majority logic can be done using only light. Not that light is practical yet, just saying its been done. five way vote of (X,Y,Z,NotCarry,NotCarry). Question: How many gates does that usually take??? I'll let you google yourselves up to speed on this, while I gather up the promised attachments. drescherjm and Red Falcon like this. Ummm, is this homework or something? If you are having to ask, that means its probably on the test. Nah, its only if you want to be ready before quantum takes over. I don't mean the weird cold stuff with entanglements and qbits. None the less: Minds and faces shall be thoroughly melted. Lets start off on the right foot by breaking promises. I said no gates, but have gone ahead and drawn gates anyhow for clarity. We can mess with the flow of gateless logic after we establish some basics. 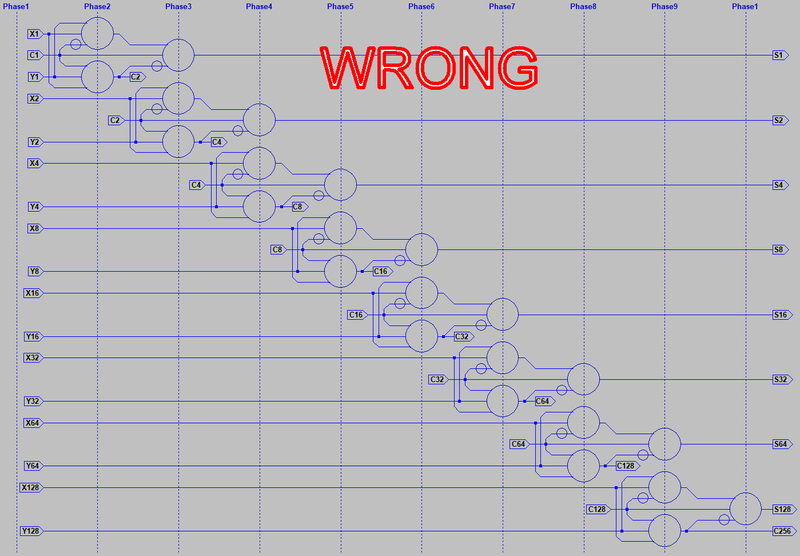 This is a full adder in Differential Majority Logic. We add up the input bits, and if there's a majority, thats a Carry. We add up the input bits, subtract two carries, and that gives us the Sum. If doing ripple carry, also consider that Carry has only one gate of delay. with that drawing, because it was less obvious how addition happens. But its all a hella lot simpler than all this, cause we won't be using gates. Before I hit you with oscillators, lets try voting with simple flipflops next. Be aware: Brochure below is for a different computer than pictured above. computers have been built of a logic you might never before have known. And its not just about the 1950s. Majority logic has been done in pure light. transistor. Light doesn't seem small or practical yet, but maybe someday. the job done. Thats why we might spend a few moments rediscovering it. So, here's a simplified drawing of a majority logic flipflop. logic state or the other. Inputs can vote upon that decision. But once decided, its stuck with that memory forever. next flipflop exactly like inputs coupled from the flipflop before. The damn thing is symmetrical with four identical pairs of I/O! What keeps the output from being an input and spoiling the vote? I will give that answer shortly, just need to draw a new picture. 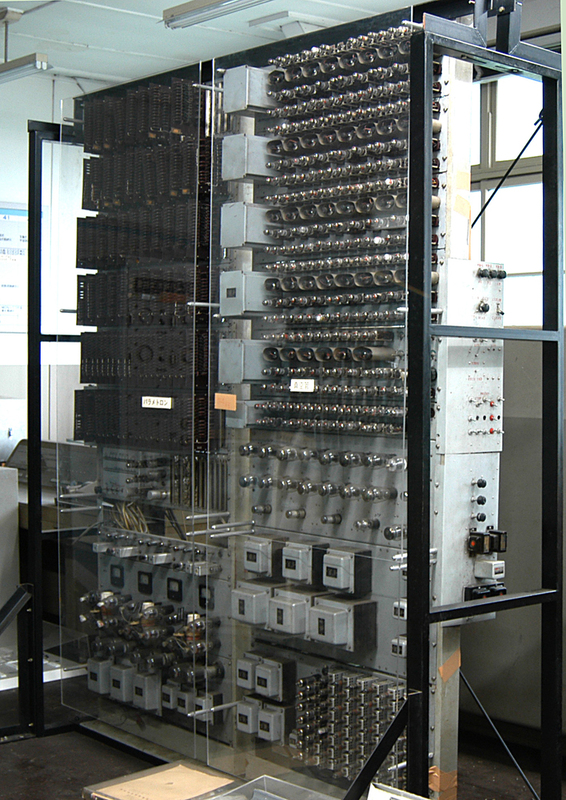 In classic Parametron Computers, three phases of clock were used to move the logic forward. Sleeping cells forget, and cast no vote (I/O pairs either disconnect or pull to the same voltage). Votes are pulled into an empty cell as it wakes, only clocks can say which direction is forward. For a big mess of wires that go exactly where they need to and nowhere else, three phases suffice. Post #5 shows us two perfect examples of partially wire directed flow that used only three phases. are fixed only to neighboring cells. Each cell would be programmed to sleep on specific phases. to a 1 wherever needed. That method might not be suitable for an array of flipflops on a chip. But each cell could be made slightly unbalanced, such that a tie always results in a constant. Might add a few axons, so signals can reach remote places faster than taking Conway's glider. mess of wires with only axons, but something sensible that leverages the best of both. In the end, anything practical will have to be a mix of programmed and prewired flows. For programming majority arrays in VHDL, let how it flows be the compiler's problem. The magnetic energy stored in an inductor is one half of it's Henry rating times the current flowing through it squared. If we build a tuned circuit consisting of a capacitor and variable inductor, its not just gonna start oscillating all by itself. periodically reducing Henries. And those currents can build up to a full scale oscillation. Now you have a Parametron. current both coming and going. Eventually amplifiying swing to full scale, and locking onto 1/2 the pump frequency. But we could swap going half cycles for coming half cycles, it would amplify and hold that oscillation just as well. pump cycles. If we listen to the resulting zeros and ones, the same as audio data stored on some early casette tapes. Next post, we cover a way to reduce Henries on demand. And with pics that will hopefully make better sense. There are other parameters we could twiddle: Variable capacitors can give a boost to Voltage when Farads reduce. what degenerate usually means around here. You might note a strange pair of toroidal transformers labeled "Excitation." Those two are wired to buck each other and produce no transformer action. without acting like a transformer. Actually its acting like a magamp. the right was directly coupled, except it doesn't matter and saved a few turns of wire. Example below I built as a random number generator, without inputs. One coupling donut shy of what you read about in the paper above. which proved an unecessary feature that didn't make any difference. Solder blob on the right is the midpoint where the two donus connect to each other. that were already glued to the donuts. So they are not mirror image of each other. Now, where the gate???? Ain't none, except maybe three for shutting down clock lines. A clock line might then be shared by several parametrons of the same timing group. cancel, reinforce, cancel, reinforce, cancel, and create the required clock waveform. Majority logic can be built of an amazing variety of things, including gates but not limited to them. minority logic, or inversion. Except thats not an actual problem, you just have to know the trick. signal wires anytime inversion is needed for free, with no delay. No need for any real inverter. lean on the parallel trick, when no better way of inverting easily presents itself. Loving these posts and information. I haven't read through everything yet, but hot-damn, this is some great information. everything else attenuated. It can really clean things up. my magic 2f tinfoil hat and attempt to channel some Engelbrecht. Too bad I don't dress quite that sharp. as it passed. Possibly two signals (transmit and recieve) simultaneously travelling in opposite directions. Not to make noise like a typical forward biased junction, and also why a transistor wouldn't have helped. enough signal, a pump with compatible timing, and feed output back to the input, we can make an oscillator. that of the pump: Would not be amplified, but would spill backward into the pump, so the system is self-limiting. The strength of a vote is amplified to a consistent output level, regardless how many or few inputs voted. but connected and listening, even to the outputs. Ready to trip on any loud enough glitch that might be heard. This relates to logic if you want a Parametron that self-starts from noise as a true random number generator. gain 1x or greater. Else your random generator will do nothing but look at you like you stOOpid or something. with reasonably strong logic inputs, might only need excitation by one or two turns of the pump to get started. Don't quite get what all the extra junctions are for in this adder, unless maybe for doing the parallel trick. its an impressive Japanese effort to carry on the work started by Eiichi Goto. Quantum, but functions not as some weird quantum computer, just a really fast regular computer. These things are actually useful in weird quantum computers too, if only for detecting the outputs. They also claim low power, like almost none. But I want to see the bill for running that fridge 24x7. Well, after way too much reading I still don't understand memristor logic in memory. 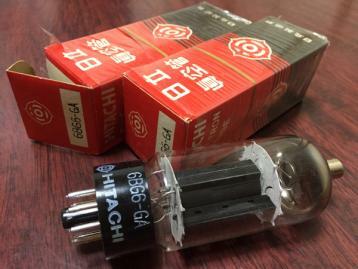 So next majority logic: I think might be Esaki Tunnel Diodes arranged in Goto Pairs. here, unless you consider the topic of "Negative Resistance" to be weird. There is no such thing as "Negative Resistance". 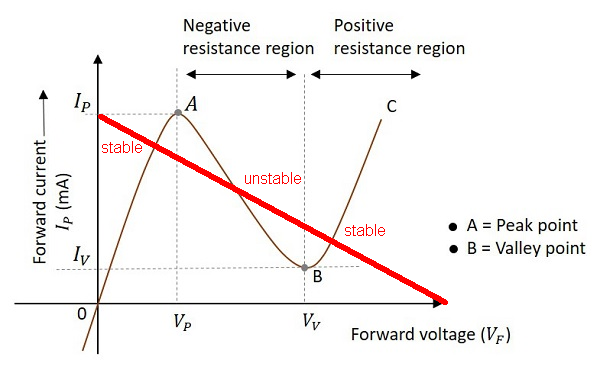 Ordinary Resistance = Volts / Amps. individually. But a dip midway in a rising curve may present a range of negative slope. "Negative Differential Resistance" definitely does exist, and sometimes damn useful. one by hooking up an old metal can 2n2222 the wrong way. It works, just not real well. use in pairs as Majority Logic devices, obsoleting his own Parametrons for decades. Parametrons did eventually made a quantum comeback, but that was only recently. unpopular=expensive, not by any technical problem that couldn't be overcome. to either of the stable points at the first opportunity. Imagine a loadline drawn from about where this slide sais "Ip" to about where it sais "Vf". Nevermind, I edited the picture so you don't have to strain your overworked imaginators. Voting at quantum speed only helps if you can forget old obsolete votes just as fast. Abusing a slow transistor as a *GATE* to interrupt power would defeat the purpose. So we need a way to pass and shunt AC power that comes from a gateless oscillator. I'm thinking maybe a Magnetron ripped from a microwave oven? Roughly 2.45GHz. The patents all seem to leave out the details of how the power clock was distributed. The second issue, which isn't a problem, is that the results of this vote non-invert. to take place. Instead of Q and Q/, should those outputs have been K and K/ ??? forward bias of a normal PN diode, so we don't have any slow turn-off behavior. And a third problem, solved in drawing, but totally forgot to explain till just now. Two thresholds fixed by tunnel diodes do not compare across the differential. or down in common mode. Both must disconnect, or both pull to the middle. I chose pull to the middle, perhaps also disconnect by virtue of insufficient bias. a result forever. Results need to move on before clock transformer saturates. 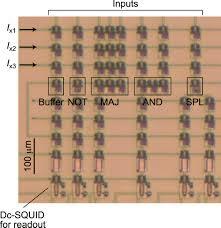 A persistent memory bit would then require a loop of three such logic devices. Or rely on DC power and a gate to turn off, which brings us back to square #1. There is no evidence I've found of a working NDR computer ever constructed. Though a huge pile of moldy-old research papers and related patents persist. Once was an NDR-Klein computer kit, but the letters were just a coincidence. I have only just looked at your ltspice diagrams and plots, but one thing that should be noted is that anything magnetic isn't going to scale to densities that are comparable to present binary logic, even with respective advantages. 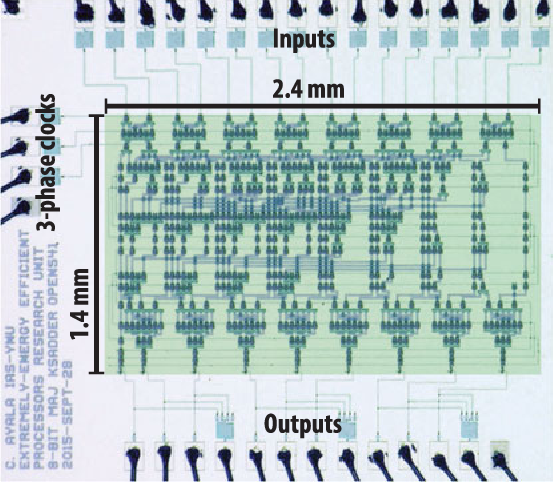 Memristor covers a few different technologies, but essentially programming in a variable resistance. Wipes the floor of every other true non-volatile tech for infinte fast writes. I got one of their 16MBit parallel bus devices to use as a huge ALU table. The old Parametron donuts weren't non-volatile like CORE or MRAM. in the phase of an oscillation. A self-refreshing dynamic ram of sorts. I'm not suggesting go back to those, except they are fun to play with. or even essential. I wanted to show you something completely different. Josephson Junction does, or how small they might could be made. And I might be wrong, but I imagine its some kinda flipflop of spin? Nothing wrong with transistor gates where those devices work best. interested how we make a working computer with those other logics. Not limited strictly to gated logic we already know too well. neither small nor cold was ever the requirement. As to the quantum logic portion: we need to cleanly identify shifts in electron energy states at extremely small charge volumes, so any smearing of that due to thermal variations (have a good read on Bose-Einstein statistics https://en.wikipedia.org/wiki/Bose–Einstein_statistics), will swamp out the underlying probability function given by the quantum logic. And, holy crap, it's been years since I've had to look at Bose-Einstein equations. 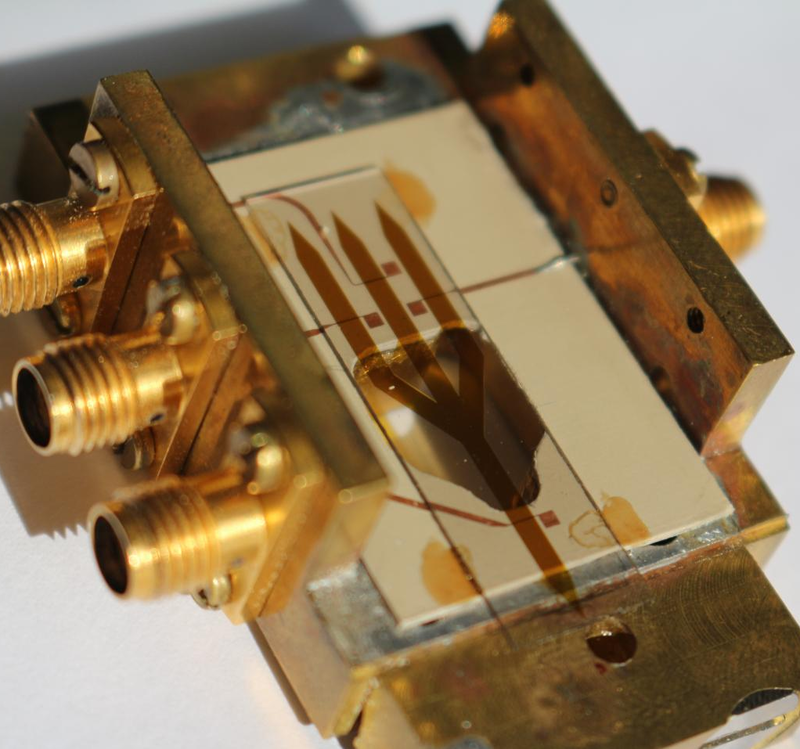 single electrons per input to leverage quantum effects. Smeared quantum works fine too. ie: Tunnel diodes at room temperature. Also couldn't find any specific detail how electrical signals at the SMA connectors are coupling to spins in the waveguide. Or could be circularly polarized, corner fed patch antennas. But why fed across to the far side of each waveguide branch? to explain something unseen? I can't tell from what little isn't hiding behind academic paywalls. Lets review: There are three primitive uses (MAJ, AND, OR) for a Majority gate. Not counting clubbing baby seals. -edit- Image replaced due to an error at bottom left gate, fixed now. 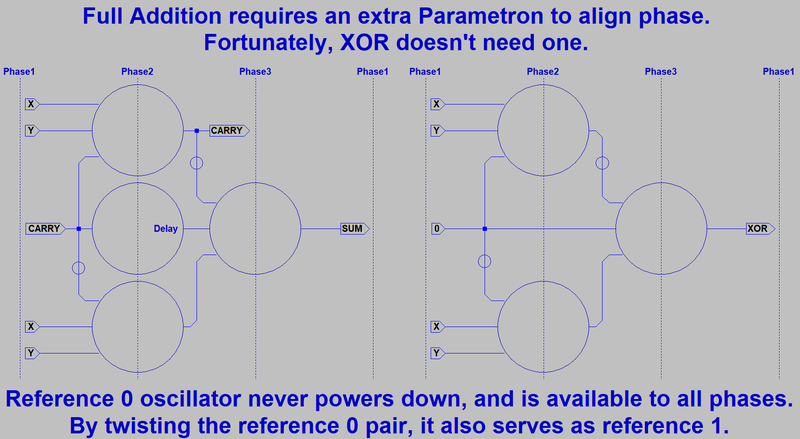 When we upgrade to Parametrons, we are no longer tied to transistors and gates. But now we have to deal with a three phase clock, and this can be a true PITA. Sometimes drawn as circles to emphasise no distiction between input and output. The smaller circles represent inverted wire pairs. 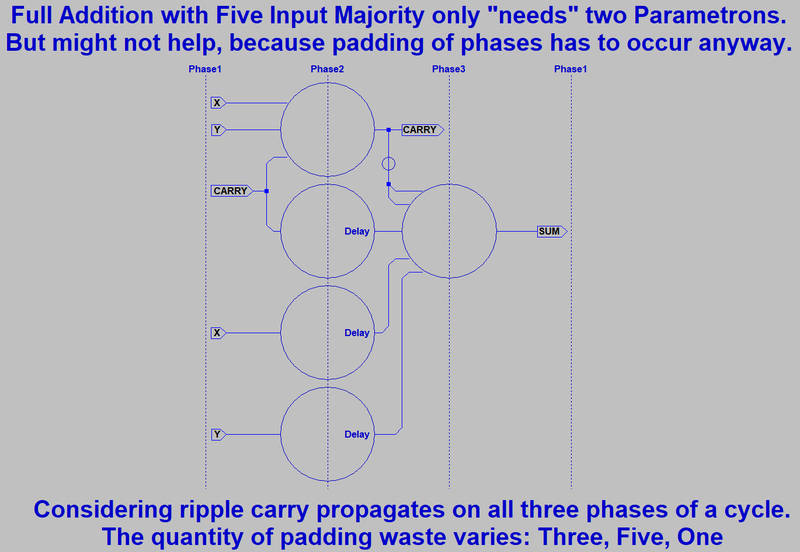 -edit- On futher consideration: Ideal padding per phase of addition might be Three, Five, Five. The drawing stands for now, as only the text was incorrect. I might replace it later. I've already figued a trick (detailed in a later post) to get rid of most of the padding. 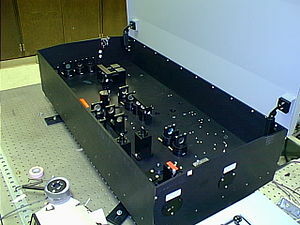 Input and outputs want to occur all of one phase. But ripple carry wants to happen on every phase. And we don't want to delay ripple. A final answer for ripple Carry requires the most steps to complete. Delay almost anything else to achieve alignment with Carry is preferrable. spin, quantum, whatever bizarro logic beats Morre first, we will be ready to deal with it. complete, it might not need so much padding. ADD without an absurd amount of padding? This might still be compatible with a 3 phase clock elsewhere. delay parametrons in the above drawing. Would a five or six phase clock make sense, or just go for 9? I find no historical precedent for it, but it looks like a 9phase clock (forget, vote, hold, hold, hold, hold, hold, hold, hold, hold, hold) might work. a useful output because the next group has to be in forget mode, else it might mistake output for an input. I'm saying the parametrons of group2 in this drawing should be forgetting at time the output is read. Everything from group3 and to the right should be holding a valid output. A new input is forming at group1, unseen to the left of the drawing. and trying to turn that output into an input. Will require an extra forget phase added for every hold phase added. 9 Phases would yield only four bits in a valid state of (forget, vote, hold, hold, hold, hold, forget, forget, forget). 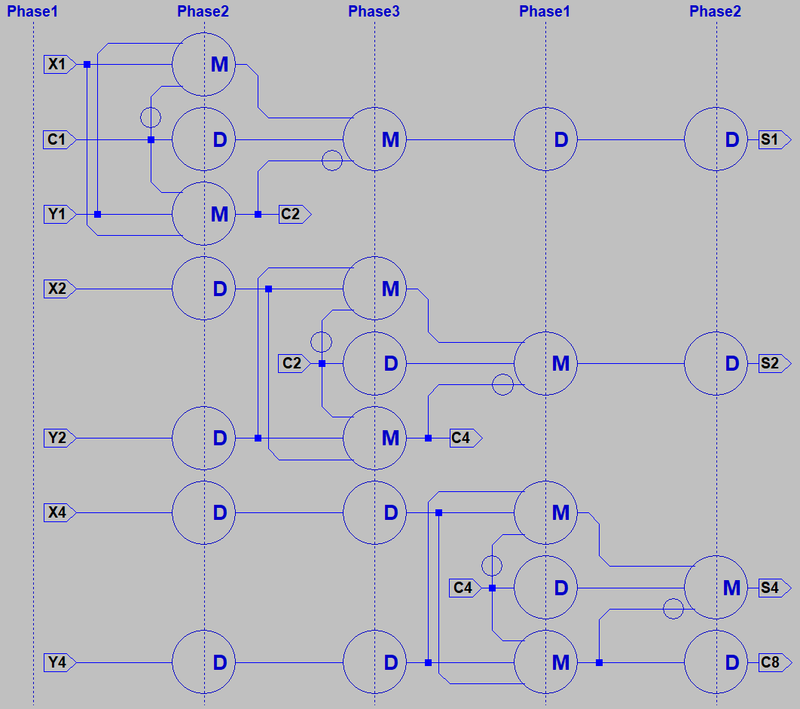 Eight of the seventeen input bits, & four of the nine output bits need hold to be stretched by a delay parametron. that have nothing to do with ripple carried ADD, SUB, or Shift Left Arithmetic. One would hope that Programmable Majority Arrays could someday be written in VHDL, just like FPGAs. have figured it all out on paper. Except in Japan they didn't even have the "50's", they had the "Showa Jidai". Timing should now be correct for 9 Phases (FFFFVHHHH) Forget, Vote, Hold. The pattern is backwards if we examine what each group is doing. All Sum bits and the final Carry can be simultaneously readout now. If we wait to any longer to read, bits held by Group7 will be forgot. 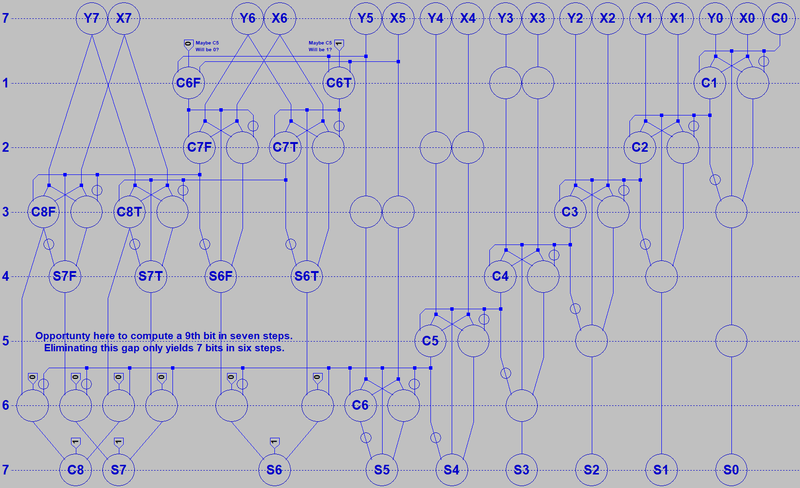 This phasing might also solve some timing problems of the 5 input Majorty adder. If so, could we rip out eight Parametrons and still arrive at the same answer? far without adding another holder. What's the point of saving one only to burn one? But seven Parametrons could be saved. I don't think anything nano, spin, or quantum does 5input, the savings would be irrelevant. If you are building an old fashioned Parametron, or flipflops, 5input probably saves parts. This is a real 8bit Majority adder. Whatever they are doing is different than what I drew. 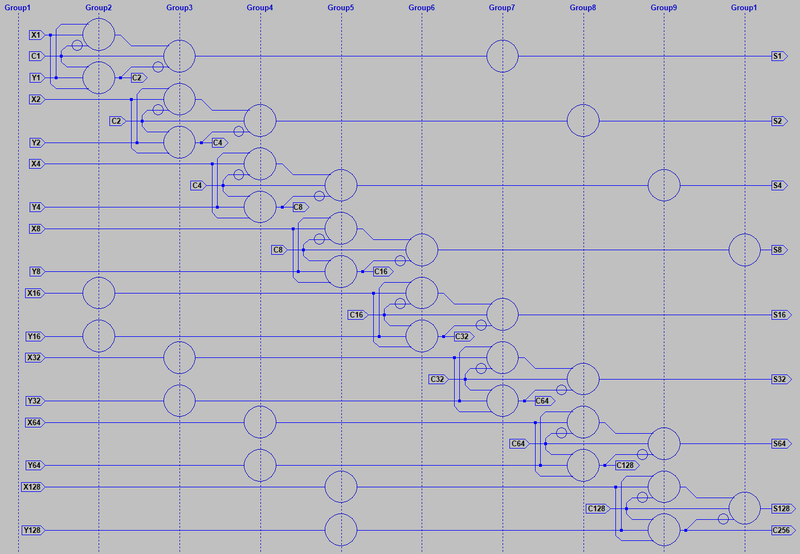 Logic blocks at every input pair look suspiciously like Propagate & Generate. We may be seeing some variant of Carry Lookahead. Examine the right side, you see a wasteful column of at least 9 do-nothings. I suspect at least half the devices in this photo do no logic, only align phase. A few more phases could make this a lot smaller, maybe even use less power. More than a few things seem a little off about this adder. While I clearly see 9 pins output, I don't see any pin dedicated to a carry input. coulda rippled 16bit addition in that same length of time, with a phase to spare. If this drawing were traditionally 3 phase clocked, a Parametron would be needed at every dotted/solid intersection. Pardon that some overlapping Parametrons might look like current sources, no symbol of that sort was intended. Also not intending to show any special interaction, just cramming for vertical drawing space. 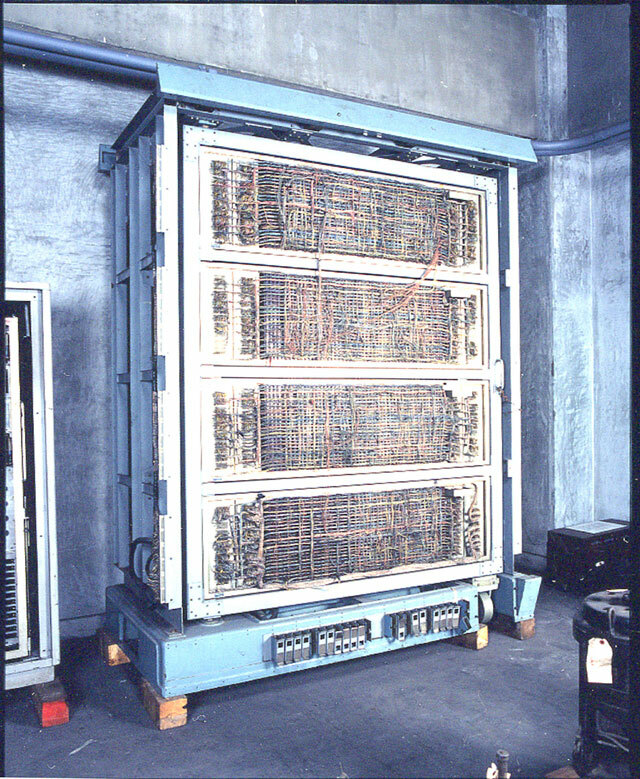 A nine phase clock can HOLD valid data for as many as four phases. Only 12 do-nothings needed. Which still seems a large quantity of waste considering no more than 17 doing any actual addition. won't HOLD quite long enough to reach Group 5. So this drawing is still slightly broken. For three phase clocks and ripple carry, bit serial addition might have made better sense. 3bits at a whack, and roll the carry back into the input. Any size numbers could be added. would be computed exactly as above, by ripple. So too would the upper four bits, except twice. save on padding, maybe enough to offset the added logic. A 9th bit of addition could have been squeezed into these 7phases. Drawing would have been too wide to fit on one screen though. Hard to say exactly how many devices "wasted", I count at least six. But one speculative third of the work is thrown away by carry select. If the job gets done 2 phases faster, does that work count as waste? Maybe not wasted, though some extra power definately burned. I think the component count here might be 57 Parametrons. How many do we count in the real 18 stage device of post #27? As long as the length/pulse timing isn't an issue I could shrink that optical layout to something that would fit in your palm.. further optimisation could get it down below CPU size easily. Fascinating thread btw, still reading though Love quantum tech and this is quite similar. Thank you! Muntzed quite a few of them donut thingies. Including outputs but not inputs, I now count about 50. I've also come to realize that filling in all blank places with do-nothings isn't a waste. parts are definitely saved. But enough to build another x1.33 to operate in parallel??? with all blanks filled and the right kind of clocking, that feature might be exploitable. Each math is separated by a solid wall of forget. Same thats driving the logic forward. be helping. I lean on copy/paste and Google translate too much. I still havn't gotten replies back from any of the dudes who know. One congrat on getting the 150KHz donut to work, but no info. They needed 18 steps to do a seven step job, but WHY? Can't help but think I've missed something important. Just occured to me what it might have been. No resistors to help isolate fanout! Assume all wires are resistors. Maybe on a cold chip they aren't? If so, a do-nothing buffer might then be needed after every split. from locking together and performing one mututal operation? may be limited too. How many inputs can one output drive? Hoping someone will chime in with the actual rules for quantum. exacly how do you split a quantum? I thought that was impossible. DC Flux Parametron (Maybe what we've been looking at so far). enough to determine if I'd even be able to understand. fewer than seven phases if total component count matters. to jam *SIX* serially multithreaded operations into one pipe. I didn't fully appreciate that feature existed on first glance. at this, for a more convenient whole number of threads. a mismatched number of threads. Without a clear statement of the rules, I'm not ready to play the quantum game. My latest attempts to scrape paywall leaks discovered only a 21 stage adder. they seem mighty proud of it too. So, let's look back on another practical example of a real parametron computer. From a day when 21 stages to add 8 bits would have been an appalling waste. it than seem needed. Perhaps interface to other devices, such as core memory? On the right we see pairs of tubes with hoods that don't appear to help ventialltion. Can't imagine any use for such a hood, unless perhaps nixies displaying numbers. Except those were going out of style by the time of this machine. To lower left, three huge pair of valves might be rectifiers, possibly mercury vapor. Just above them, three quartets of beam power tetrodes with sparkplug tops. I got some like that in my guitar amp (world's most dangerous plank) in storage. Can't remember the number, but was like a higher voltage rated variant of 6L6. -edit- 6BG6 was the beast I was thinking of, plank not necessarily this computer. 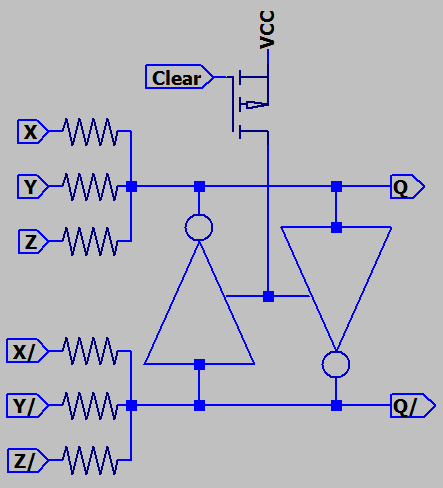 Clocks need DC bias, so the usual output transformer could have been omitted. I think we are seeing about 200W output power per each of three phase clocks. The consumed power would definitely have been higher than output. 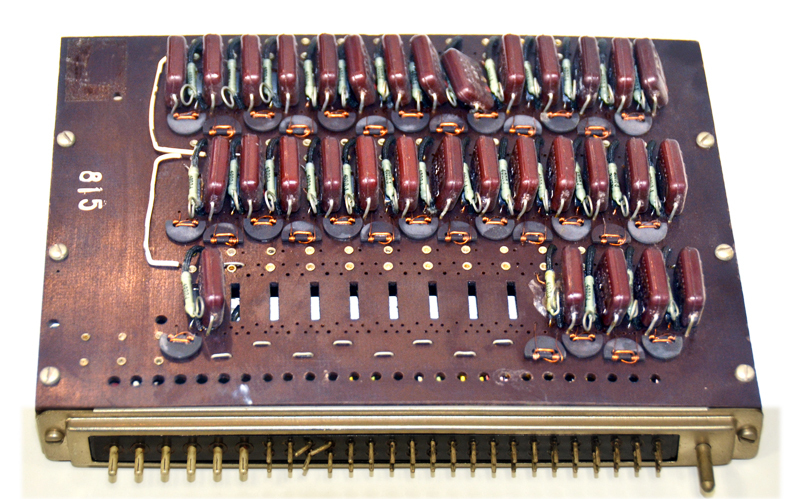 On each circuit card, we can see capacitors and magamps populate the front side. Ferrite appears to have been formed as common 4 hole buttons, then sawn in half. with one side partially milled away? exciting clock line threads once through each dount hole in the opposite direction. overdrive the thin-shaved edge of the buttons, and and thereby lower inductance. 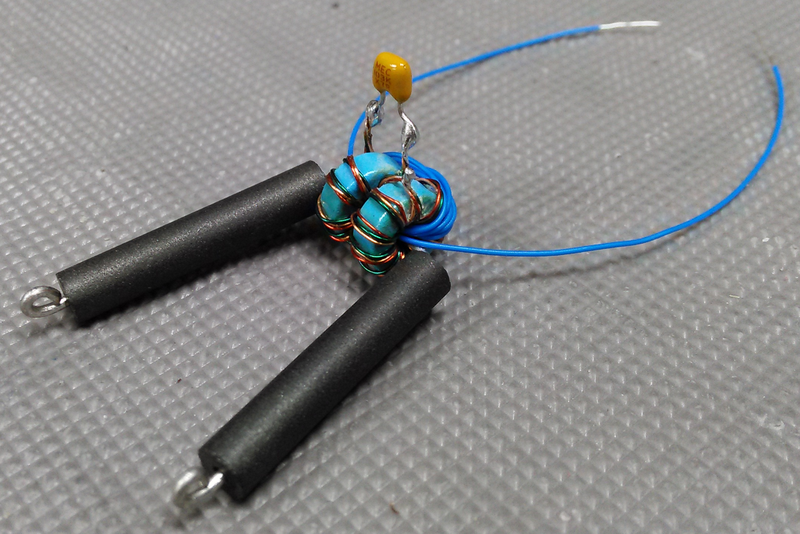 Inductance needs to be lowered twice per cycle, to amplify and sustain oscillation. clear grouping of three phases I, II, III. Hitachi etched them so, on the left. button, which is why this more common shape wasn't used for both sides. On the right, we see 6 thick pins for driving the three clock phases. Current goes in, current comes out, so six pins to handle three clocks. 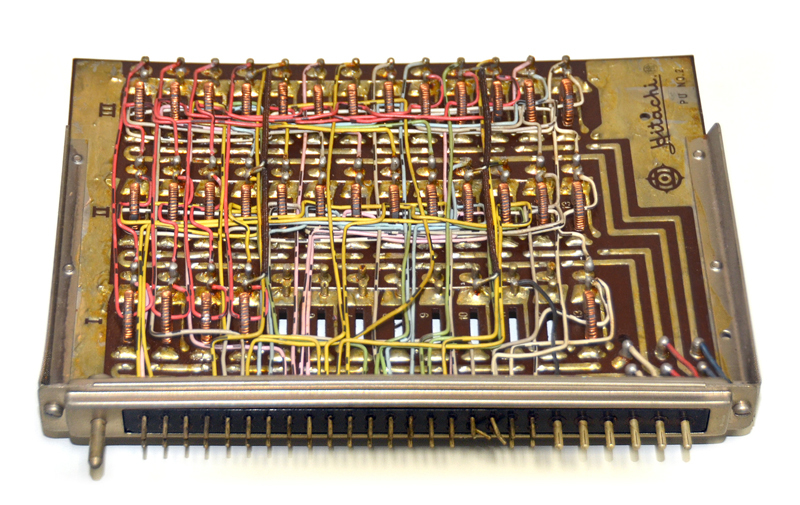 I'd be furious at whoever bent those middle pins, cause this card looks like it would still work. hiding somewhere behind the backplane? I suspect quantum needs so many stages because it uses no resistors to split and mix I/O. For quantum, I think maybe something like this may be going on? Logic seems to be fighting it out in manifolds inbetween latches. except output splits sometimes require a dedicated extra step. -edit- Messed up left full adder, the one made of entirely of inverters. I shoulda downvoted MAJ5 by two carries instead of upvoting by two. step, and then X,Y,Z,C/,C/ or X/,Y/,Z/,C,C could be properly aligned. Either alignment would have let me compute a proper Sum or Sum/. Don't worry bout step 4 not drawn above. As we ripple carry more bits, it will get used. 5 phases permit two steps behind each vote to remember, while two steps ahead forget. Else each vote (in a 3 phase system) could only reference the most recent prior state. 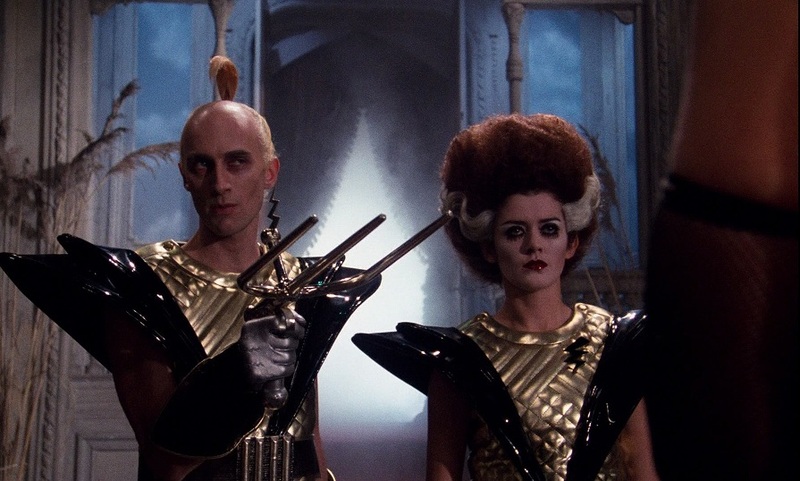 Clearly we didn't need real inverts when a mirror universe exists next door. machine, and we have an option to reach more than one step back in time. If inverting is optional for every device, there was no problem to begin with. so we don't waste time splitting those again for the next bit. Suppose Z is our carry input. See where Z splits at stage 1? 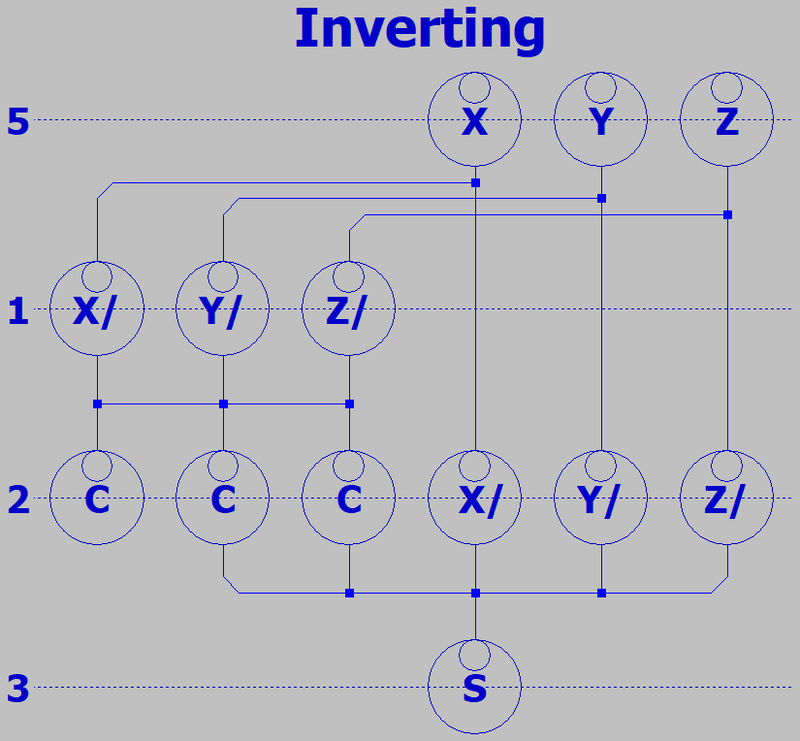 Dunno if Josephson Juntions can invert, always invert, maybe its optional? What I can make of photos don't seem like they've been trying the mirror trick. Nor have they been taking advantage of 5 input majority, maybe they can't? I still don't fathom why 21 stages for an 8 bit carry lookahead adder. Especially when they had proven an 18 step adder just a few years ago. lower latency. I would expect seven stages to be no problem. Maybe a patent thing keeps them from adding more efficiently? They did hit 5GHz on the 21 stage adder, gotta give em that. And likely with seven ADDs simultaneously in the pipeline. This blurry thumbnail answers at least one of my questions. So, there is no need for a duplicate inverted machine. before getting into trouble, nor how many inputs max. fanout works, & lower fanin less susceptible to noise. can pre-spit and ready to ripple in one step. even the first bit's carry could be known in just one step. I need to buy an old book "Advances in Quantum Flux Parametron Design" by Goto and his team. 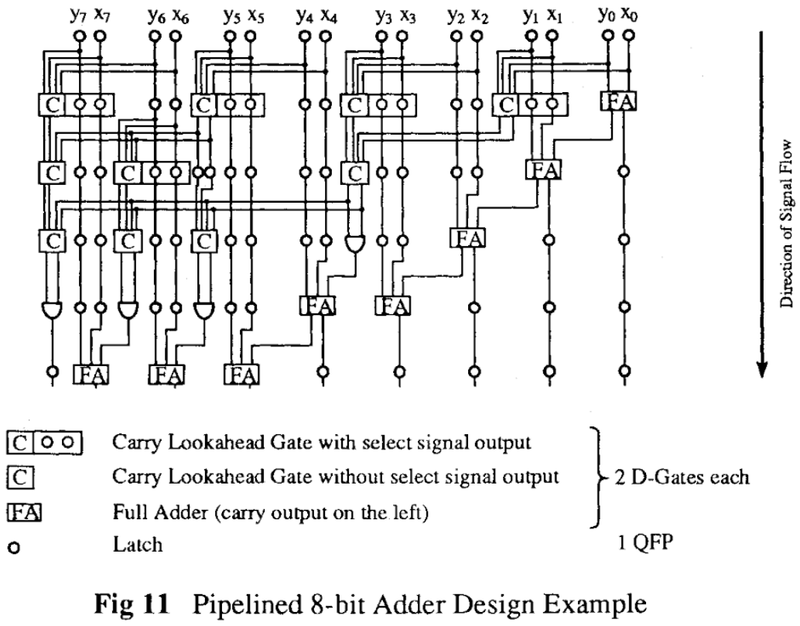 From what little I can preview on Google Books, he had an 8bit adder that worked in just 5 steps. Lets also assume FA on the right allows for a carry input, as every other FA in this drawing does. -edit- Wouldn't work. Carry lookahead would have to know that input too, and use another step. A "Co" input cannot simply be tacked onto this drawing. think it depends on Josephson Junctions to work. Did they even have superconductivity in 68? Superconductivity was discovered tomorrow (April 8th) 107 years ago (1911). And Josephson Junctions might have been possible recently as 1962. So, D-Gates could be just a JJ thing? I'm still slightly in the dark. helps when comparing pineapples to pineapples. 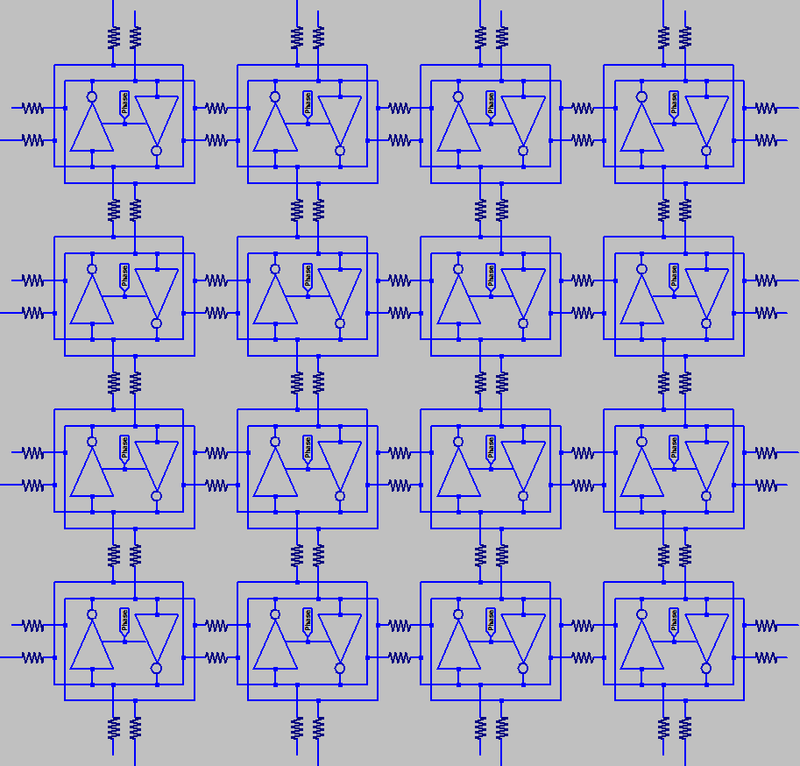 logic devices without locking them together as one lumped vote. But Takahashi's D-Gate seems to turn this problem to advantage. Suppose a pair of Parametrons driven by insufficent excitation. we might make a Multiplexer. D-Gate appears to be such a device. from the clock, but from two other Parametrons of the same clock. final answer is held to the clock, just like any other Parametron. double frequency needed to open one of the blocking Parametrons. So, we have a total of four inputs: X Y, only one will be passed. Also W Z, which choose X if they are the same, else they pass Y. All this boils down to one latched output. This tricky gate can be wired up for CARRY (same as MAJORITY). Seems a waste, since a single Parametron could already do that. But can also be wired PARITY (same as SUM) in the same cycle. mutual coupling problems without burning an extra stage to do it. 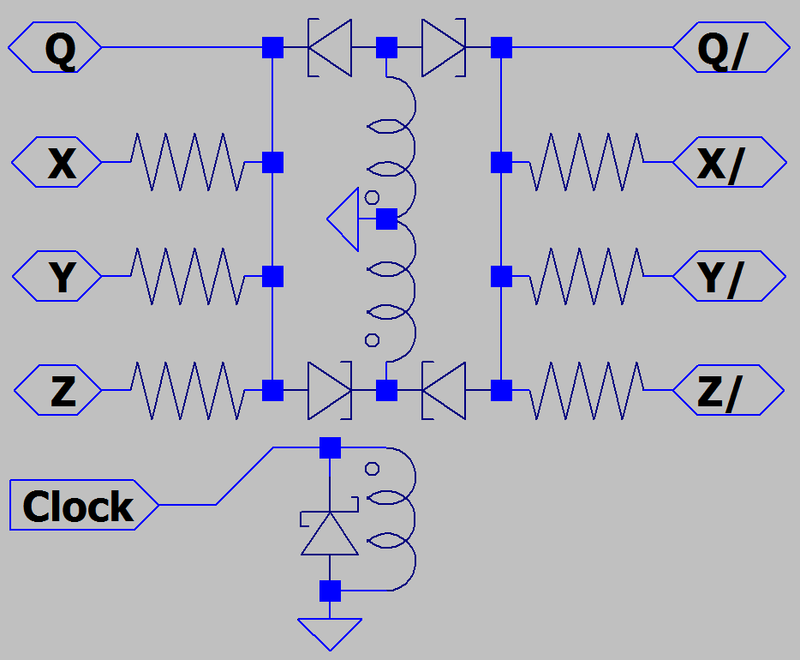 pairs, making the Double D-Gate. looks suspiciously like a relay. much the earlier LC style that Takahashi might have built. machine with 12 operations in progress in two pipes! instructions of the same thread that didn't have to wait thier turn. Double D-Gate I mean. Two gates sharing one drive pair, else would be Single Pole. Took me weeks just to figure that out. Fortunately, designing with them is a lot simpler. When inputs located on the side agree, the mux arrow points as drawn on the symbol. When inputs located on the side differ, the arrow re-aims to the normally open position. For sake of uncluttered drawing, let side inputs also pass through to the other side. 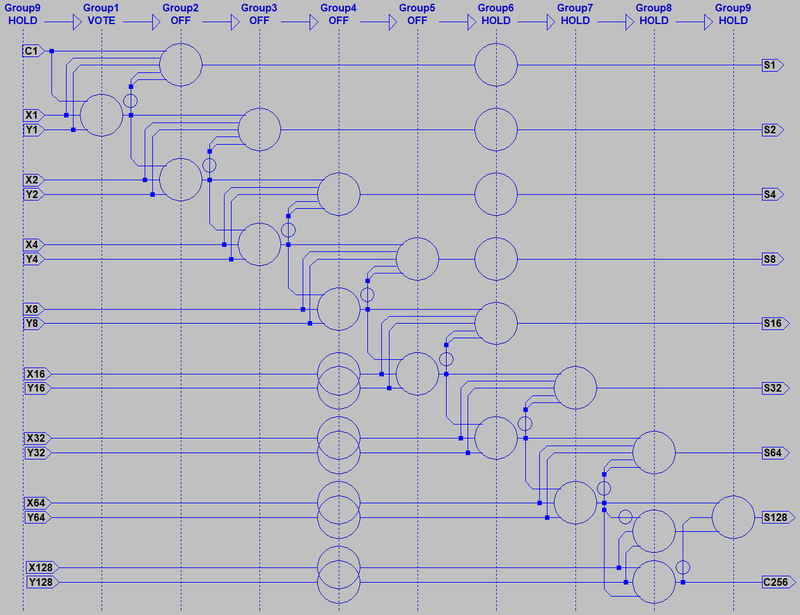 If I was drawing a Double D, probably just stick them side by side w. implied wiring. Note: XYZ order doesn't matter for MAJORITY, CARRY, SUM, or DIFFERENCE. starting number that negative numbers Y and Z would be subtracting away from. AND and GENERATECARRY are exactly identical operations. OR and PROPAGATECARRY are identical. MAJ and CARRY are identical. SUM, DIFFERENCE, and PARITY are identical too. XOR is just SUM with an input stuck at zero. AND is just MAJ with an input stuck at zero. OR is just MAJ with an input stuck at one. Any one input could serve as the stuck input, doesn't matter which one. Where I've drawn X and X/ going into SUM, together count as one input for this rule. would not automatically form a pipeline. opportunity to invert for free. Might need extra inverter relays which add even more delay. A parallel opposite machine, or full differential operation may avoid those inversion delays. But double the contact count would also be double opportunity for a mechanical failure. D-Gates get around all those problems. Free inversion. Latch an answer at each stage. Clearly very different, yet too many similarities with Relay Logic to be mere coincidence. The updated drawing above shows very much what similarities I'm talking about. Takahashi (edited), "Parametron Computer," Iwa-nami Publishing, 1968. May have to resort to searching in Japanese. I'm no good at it. thinking "Isn't that also the 1st word of your national anthem???" Was better off learning from toons. Still digging for Takahashi clues in old books. Majority gates seem to have been in use well before Takahashi or Goto. Those inhibit lines could have been useful for clocking a pipeline. I don't have any clue if thats what they were actually for though. Doesn't say what Turing's take on inverters might have been. Seems you could input a constant 1, then maybe inhibit it. absolute, but has the author interpreted this symbol correctly? How else might the threshold value of "m" have been set? Today, Professor Eiiti Wada wrote me to correct my Romanization of names. write his own name. I had never heard of either system before today. translate the spellings differently. Eiichi Goto used Hepburn to spell his name. choose the system for dummies like me? might be able to get a Parametron question or two answered in return. I now have 1st draft of EDVAC, and inhibit was absolute as the book described. a very difficult substitute for inversion and required more gates than it saved. he had a cheat sheet from a decade later to show an easier way. Any inputs of AND that might be inverted would behave the same as an inhibit. 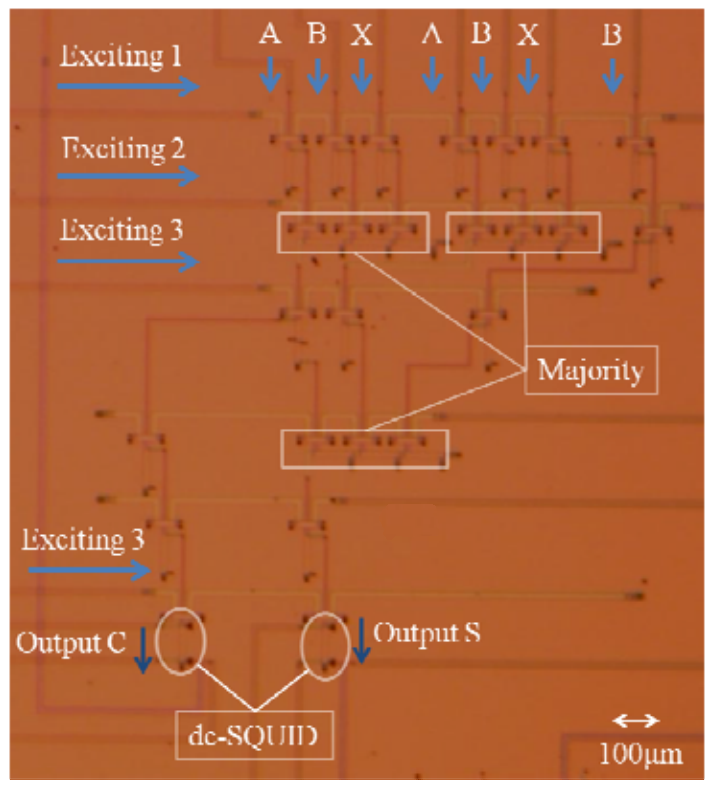 the output), or NAND with an inhibit (by inverting one input). Again this is guessing, how I might have done it, not based on real evidence. other ancient insight on how to do AND without resorting to catswhiskers? Another clues come from learning that Alan Blumlein worked with both of them. he was responsible for Turing and Neumann being on much the same page? "Garter Bias" was a trick for adjusting tubes to match better.